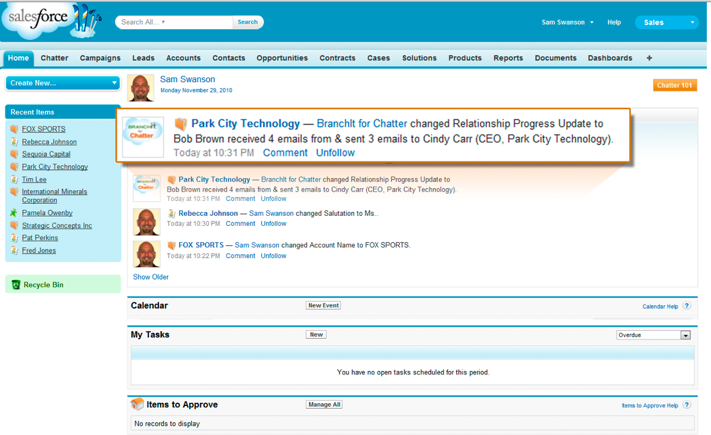 Specifically, BranchIt for Chatter aims to uncover relationships held by employees across the entire company and feed them through Salesforce Chatter. Functionality includes automated contact syncing, relationship strength scoring, contact following, account following and more. You can update your colleagues on who you’re meeting with, and obtain personal introductions to contacts from colleagues. Since launching last year, BranchIt has signed up over 20,000 business users including Bell Aliant, Penske, Enterasys Networks, Freeman, and William Blair. The app also won Salesforce’s AppQuest competition. The startup is also keeping BranchIt free for the remainder of 2011. Adding a social and contextual layer on top of email is certainly something that Salesforce is looking to integrate into its own offerings. The company recently bought email contact manager Etacts.